If you enjoy making handmade jewelry, learning how to make an angel out of beads can add an interesting twist to your crafting sessions. Angels are a popular choice for craft projects because they are seen as a link between Heaven and Earth. The word "angel" comes from the Greek word for messenger. Because of this, angels are often portrayed as messengers sent by God to protect us from evil. Angels are referenced in the scriptures of Christianity, Judaism, and Islam. The image of a guardian angel who watches over those in need, particularly children, is common throughout the world. Angels are most often seen as a home décor item around the Christmas holiday, although angel decorations can be left up throughout the year if you wish. 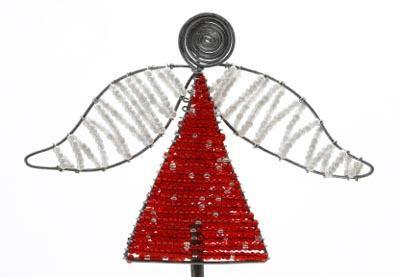 Depending upon their size and style, beaded angels have many different uses. If you're a beginner, choose a pattern that involves larger beads. Seed bead projects, while very beautiful, require great patience and attention to detail. Read all of the instructions two or three times before you begin your project to make sure you understand what needs to be done. There's nothing more frustrating than having to take apart your work because your angel doesn't stand up correctly! Clear crystal beads are the most popular choice for projects that involve making beaded angels, but you can save money by using acrylic beads if you wish. You can add further sparkle to your angel by using silver, gold, or copper spacer beads as needed. Always buy a few more beads than you think you'll need for your project. Sometimes you might find the beads have holes that are unevenly spaced. Also, it's easy to misplace beads if you're not paying attention when you're working. Witty Living showcases several difference techniques for making beaded angel charms. Make Stuff has instructions for a simple beaded angel. Give this project many different looks by choosing beads of assorted colors. Craft Bits describes how to make a tiny angel out of beads and safety pins. Bead Jewelry Making shows you how to make a pretty beaded angel that will sit on your table. All Free Crafts has an idea for a beaded guardian angel that you can give with an accompanying poem. This would be a great choice for a project for a church fundraiser. Wig Jig has a very contemporary looking angel project that's perfect for crafters who enjoy using wire working techniques. About Family Crafts has a pattern to make beaded safety pin angel jewelry. A Bead Store has instructions for making a beaded angel bracelet. Making Friends has instructions for a simple pony bead angel that is easy enough for elementary school children to make with minimal adult supervision.